Taggard had been pushing @Wallace maybe more than they should have. There was little time for rest or hunting, as it was imperative that they reached the Rift as soon as possible. They were hungry, scavenging on meals as they stumbled over abandoned kills and feasting on small prey like squirrels or doves. Wallace continued to look weary, and finally Taggard had given in and decided that they would have a few days of rest. They had rested that night, and Taggard set out early in the morning, as they usually did, leaving Wallace to his own devices for the rest of the day. They were out of Eden, the denseness of the forest opening up to a new land, whose name escaped the pale wolf. Ourania was a strange land, and with few wolves to ask questions, Taggard found themselves in the dark more than not. Tagg did not like having so many questions and so few answers. Although Ravka had not been entirely forthcoming with information, Taggard felt the sting of regret that they had not stayed and asked more questions. The wolf was eager to find the Rift and see it with their own eyes, and hopefully in seeing some of the wrath of the gods, Tagg could come to understand their fury. Then they'd deal with it when it happened. For now, Taggard had given themselves the task of making a new temporary home. It had been a while since Tagg had been in a den, and even longer since they'd dug one out, but the task would be hard and hopefully leave them tired enough to rest. The new place they were had beautiful rolling hills and long grasses. This offered little shade during Wallace and their travels. But Tagg had found one tree that stood proudly among the grasses, and was now at the base of it, digging away. Roots and grass and dirt flew behind them as they focused on only the task at hand. Night was a veil that shrouded the passage of a lone creature, a wolf born of the night, opposing the kingdom of the holy sun. Tolkïen had always been most at peace when the moon rose on high, a lantern pale and lonesome, a solitary star to guide her path. Since she had left Uriel behind, the Wåhfarer had taken to travelling only in the silence, the obsidian crowl shielding her from eyes who may see her from a distance. It was easier, safer, and she was less likely to encounter an equine, who's eyes were not adapt to the feeble silverscape. Udane was well into its life, each day the breeze growing warmer, the days lasting longer. Had she felt safe enough, the raven would have shed her mantle, leaving her pale back the breath of a naked caress. But, the memories of the rift lingered, the visions hounding her dreams, making the instability of Ourania all the more obvious. She wouldn't afford to leave herself an easy escape. The sun had long risen from its hidden world, the horizon a golden haze and the hills vibrant and alive, an endless carpet of emerald, kissed by jewels of many colors. The springtide of blooms had been an idle prettiness, one that had drawn her eye for a moment, before she had found the old oak. Its branches were immense, gnarled with age, and it had not taken her long to find a perch in the borrows, her talons cutting fine etches. The wood was warm and her breath was slow, her crown settled on her paws as she slept the day away. It wasn't the scent that had drawn her from slumber, content in her perch high above the ground. There had been other creatures who had passed in the hours leading up to highsun, a curious deer, an errant group a blur in the distance. They had never come close enough to warrent her concern, not until she had first caught the disturbance amongst the roots. Her eyes opened slowly, dawn blush upon her pale face, squinting at the play of light amongst the branches. An itch lingered at her nape, where heat of the day had dampened her fur with sweat, yet, she made not move to shift, her body warm. "Mhmm," yawning, she looked down, her chin coming to rest lazily at the edge of her perch. From the angle she was, all that was visible was the shower of dirt and stone, a ragged wing splayed across the worn grass. "You're quite the eager little digger." Taggard pushed themselves hard, digging as quickly as they could. They paid attention to the gritty dirt between their pawpads, the sound as their claws scraped at the earth, the smell of soil and roots and grass. They had been so focused on their task that the thought of another wolf being up in the tree had not even entered their mind, and so by the time Tolkien had stirred, Tagg had a sizeable hole started. Not one to call a home, but it was at least a cool dent in the ground to sleep. Their limbs ached, not only from the vigorous digging, but from the long journey from the north. Taggard had not rested well when her father had exiled her, and with frustrating continuing to bubble in the pit of their stomach, Tagg refused to truly rest. There was a sound of a voice, and at first Tagg thought Wallace had returned. They stopped for a moment, glancing around to see no familiar, nor unfamiliar face. Choosing to believe it was a trick of her ears, Taggard continued to dig. The voice again, but this time coherent words and an unfamiliar voice. It was close, and Tagg's new company had offered no warning. Startled, Taggard quickly jumped from their freshly dug hole to find... no one? Again? They certainly had not just been hearing things, as Tagg had not succumbed to their paranoia just yet. This time the pale wolf used her nose and smelled a wolf. They looked up and... "Oh!" they gasped out, suddenly feeling silly. Taggard was panting heavily, their chest heaving as they studied the wolf. There was silence for a moment, the air filled with nothing but heavy breathing and the hum of the world. The wolf above her was... delicate. Beautiful, but not in the way that Taggard enjoyed. The horned woman also noticed the wolf's front paws, scaled and sharp and not unlike a bird's claw. Tagg's tongue lolled out, "A busy body is a quiet mind," they explained, "but please, accept my sincerest apologies. Had I known this was your tree, I would have looked elsewhere for shelter." And Taggard certainly would not have done all of that digging. Still, though, they were covered in dirt and were now tired, which had been more important to the pale wolf than making a temporary den had been. "I am Taggard Swift, of the North. My companion and I have been traveling for some time, and it was my intention to make us a temporary home so we may rest for a few days." Taggard's eyes remained on the wolf's front paws, eyes tracing over each pale white scale. "Tell me: why do you rest in the tree, instead of on the ground? Do your bird-talons urge you to perch so high?" The digging stopped abruptly, a pause in the chorus that had drawn her from depths of her dreams, fleeting memories carrying twisted images of empty eyes and death. She had never been a creature of the earth, taking comfort in hidden passages amongst the trees, of the old and worn carverns where her kin had slumbered, protected from the elements and all the horrors of the land. Perhaps it was a lingering loathing, of the darkness, the loneliness, of the den where she had been hidden away, too weak to join her people in their daily lives. A ghost in the shadows. By the time she had grown and the immortality flowed into her, Tolkïen had found strength for the first time, and stepped from the burrow. She had never gone back. The world had seemed so vast then, viewed from the trees, willful, unwilling to come to heel at their bid for her care. The pale raven, so much like the ravens of the past, so unlike the enduring force they had become. The further she had gone from the darkness of the earth, the farther her eyes could see, the more she could feel, of the great western breeze, carrying its smells from foreign horizons, and the sun, bright and blinding, warm upon her fur. Her nights had turned to drink in the newness of the world, thirsting for more, rising with the first rays that bled the sky red. She was no digger. Peering down from above, Tolkïen watched with a slow amusement at their startled suspicion, tilting her head, tracking the errand steps as the stranger spun around, looking for the interloper. Then, they had enough sense to look up, the Wåhfarer offering a slow, coy slant to their gaze. "It is not my tree. I am merely here until the sun begins to set, then, I will be on my way." "The trees are safer, confident beasts are less likely to look up." That, and most equine and canines she had encountered did not possess the dexterity to pull themselves off the ground. The treetops had in many ways, become her realm, a place where she excelled, gaining comfort and reprieve from the vulnerability that came with travelling alone. Slowly, she rose, drawing her nimble feet beneath her, a strange creation born of canid and avian. Her movements sung of humming metals, the gold glinting in the morning light, dazzling casts against the green canopy and earthern branches. They were wide enough that she could stand there comfortably, before slowly, she knelt, her cunning limbs curling around the wood, the dense black furs of her crowl pooling against her shoulders. "I am Tolkïen Wåhlander of Ourania. You have come to these lands at a time of tentitive peace I suppose. Your travels should be uncontested." A forced peace, the masses scattered and disorganized. What would happen in the coming days, she didn't know, not with weight of the warning carried from the depths of the Rift itself. A Spirit Orb has been discovered! It was a relief to know that Taggard's hard work had not been futile, and the wolf's tail gave a light wag at the realization. If the other intended to leave, that meant that Tagg could continue their digging, and they and their companion would have a comfortable place to rest. The pale wolf looked down at the hole, which had a lot of work to do. But not wanting to be rude, Tagg decided to take some time and get to know a little about their new company. Glancing towards the sun, Tagg wondered if the wolf's pale fur had anything to do with her seeking shade instead of walking about during the day. They had lived a life or two where being in the light burned their skin, but the memories were vague and Tagg was not particularly one to dwell on the past. "Then for now I will try to be good company," Taggard offered another swipe of their tail, a friendly smile quickly finding its way to the wolf's face. Taggard was interested in the tree-dwelling wolf, and although they did not have dexterous claws, they wondered if climbing into the tree was feasible. Looking for the lowest branch, they kicked off of the ground to place their front paws on it. "I wonder, do you say that to offend me?" their words were playful, though Taggard did not smile as they concentrated on the weight of the branch. Tagg was not light and fragile, but perhaps agile enough to attempt the climb. They pressed their paws onto the branch to test it, and when it did not snap, the wolf gathered their confidence and jumped. It was a wobbly start, the tree angrily shaking under Taggard's unsteady weight. Leaves fell to the ground, branches cracked, but when Tagg felt more certain of themselves the shaking stopped. Their expression was proud, confidence finding its place in their heart. The wolf offered her name, and perhaps even more interesting were the words that followed. The pale wolf found the next highest branch, and hopefully one that was sturdy enough to hold more weight. "I confess, my knowledge of this place is little. I am discovering new things each day, and Ourania's soil is strong with its magic." It took them a few moments to muster the courage, but when they were ready, they leaped.... and stuck the landing! Again, the branch shook as Taggard found their balance. "My companion and I are on the way to the Rift, where the gods tore into the anger with the earth." Taggard wasn't entirely sure how true that was, but it was at least a start. 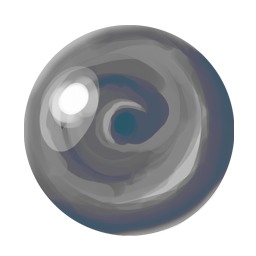 And then, as if to confirm how little Tagg knew of Ourania, another one of those strange, floating orbs appeared. This one was a different, much less colorful version of the one they had encountered earlier. The strange thing floated a few branches above Tolkïen, hovering as if tempting the two with its presence. "Ah, one of those things again," Tagg motioned to the thing with their snout. "We had encountered one before, but... admittedly, I do fear things I am uneducated in." It had seemed harmless enough, not moving towards Taggard and simply seemed to just... be. Whether or not it was threatening made no difference to Tagg, who was uncomfortable with it in their presence. The world was full of things to fear, beasts and monsters, distant lands, their canvas unfurling with a story both strange and vivid. It was impossible not to realize that Ourania was just a part of a whole far greater then she could possibly understand. To the wise women of her clan, these uncertainities were left to the dominion of the divine, those who had created the world, and those would destroy it, so it seemed. It was almost expected now, glimpses of the past, terrible creations of her kind that had laid ruin to all that had been beautiful and fresh. Even now, she could remember the visions bestowed them in that burrow, guided by a star touched hare to the resting place of wraith of lore. While the rest were content with their war, Tolkïen had begun to wander, what was the true consequences of their actions, what did it mean, what would come of the death of the gods, the death of Ourania herself. Perhaps not yet, the land still prospered, still healed after the miasma of ash and magic gave way, revealing to them the path back, but, the wound lingered, sore and raw. It could very well still spell the end. "Perhaps," the Wåhfarer smirked, her teeth sharp and feral beneath the shadow cowl of polished ebony. Tilting her chin up, a motion that would have looked pretentious if not for its purpose of bringing her gaze into line with the other. Pale rose, darkened beneath the weight of dark feathers, breathed life into her expression, amused, before she laughed. "But then you did look up so it wouldn't be valid anymore... would it?" How long had it been, since she had encountered another of her kind, one who was unaware of all the hardships that in some way, bound them together. An outsider, new, virgin to the war, making a treck across the land to gaze upon that one part that still carried a phantom touch of what came before. Part of her wanted to hate them, a spark of outrage at the lightness marking her words, yet, another sitll wanted to keep them at bay. One less to fall should the Ouranians seek to destroy themselves. Tolkïen had never been heartless, only, distant, reclusive in all that they believed and desired. Watching as the crowned woman make an attempt to reach the canopy, Tolkïen relaxed back, her eyes tracing the path they took. With each lurch of the tree, she shifted subtly, keeping her balance with a thoughtless ease, talons leaving scores bright and green in the oaks wood. "There are many who doubt whether it was the gods doing, or whether it was our own power that had grown too great. 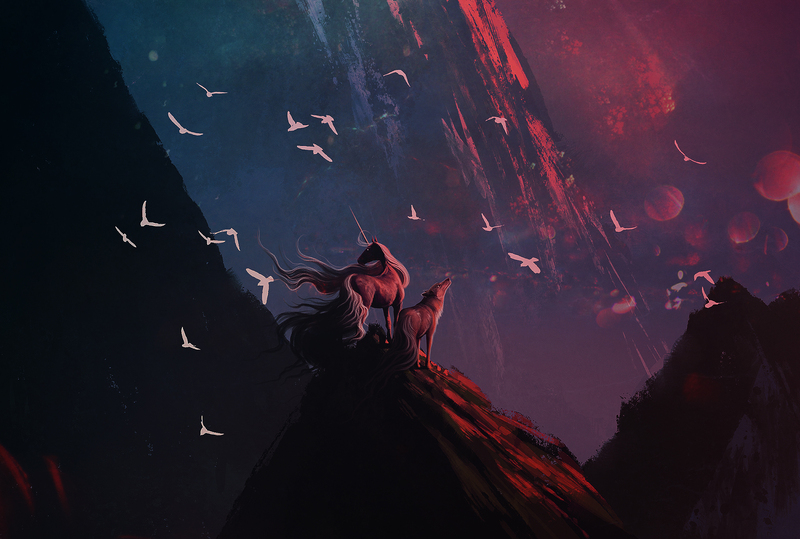 The Rift is but one of the many scars where canid and equus met in battle, trying to wipe each other from the face of this earth." Moving, she followed along the gentle slopes of the branch, each step accompanied by the merry chime of golden chains. "Perhaps though the gods have grown too tired of our feud and tore the land, to keep us apart." If that had been the intent, then it had been for naught. Even now, she could smell the faint aroma of the equus, their paths cutting through the land, met in turn by the familiar perfume of her own creed. It would not be long, before yet another scrimmage broke out; with far too many sore memories and emotions running high. Too much loss to forgive. "Ah, one of those things again. We had encountered one before, but... admittedly, I do fear things I am uneducated in." Looking up, the raven knew what it was before she laid eyes upon it. The magic was part of Ourania, just as Taggard had said, a sense as familiar to the people as the scent of a distant storm to the north, or the gleam of light off the eastern sea. It appeared feeble and pale, faded around the edges as if she gazed upon it through a veil. The wisp floated down, revealed from the heart of the tree as a drop of dew on a leaf, and Tolkïen, tracked its lazy fall slowly, before reaching out, her scales cast into an incandescent shine. "It's an orb; fragments of aura magic that live in every facet of Ourania. If you touch them you gain a power." Her heart quaked in her chest, yet, she bore the weight that settled in her chest with a steadfast resolve. The coiling essence that seemed to curl just beneath her flesh, peeling it away, until it seemed to float there, surrounding her, yet, not part of her, as the cowl she had always bore. Flexing avian toes, Tolkïen drew away slowly, only to settle back against her perch. "You won't know what it is until later." Description: A strange thing, to not ever quite feel as if one belonged in their own skin. Tolkïen has gleaned the power of skinchanging, or, the ability for her spirit to pass from one body to another. Her own original form will forever be her anchor, her return point, yet, with time, and experience, she can either merely exist in another body, a back seat driver so to speak, or take full possession of the form for a time. The more mentally strong a creature, the harder it is to possess and maintain control, whereas lesser creatures she can take residence in for a time. While she does not gain physical signs, if she experiencing injuries, or even death in another form, the pain and trauma followers her back to her original self.